Career is a very important aspect of anyone's life. Choosing a career in a certain stream defines the future of a student. However, it is difficult for a student to choose a career path at the early age. 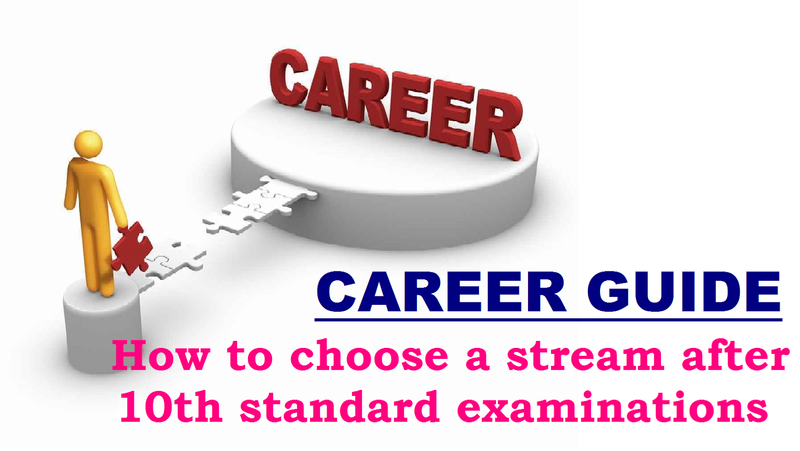 This article contains some guidance about how to choose a stream after 10th standard. I am giving some information on various streams and career options available for a student in each of the streams. Hope students will find the article helpful in deciding a suitable career option. Choosing a career in a particular stream or profession right at the beginning has a long lasting impact on a student’s future. It is very important for any student to choose carefully from various options available to him or her vis a vis his or her interest. In order to achieve success, one has to select the path which they like to walk on. Good judgment and right kind of aptitude coupled with guidance in the right direction to pick up a definite stream helps one in choosing the right career option. So from the very beginning a student should be careful in making choice of their stream. As soon as a student reaches 10th standard, some kind of pressure of choosing a career path linger in their mind. Because by then they are at the edge of completing their school life and it is peak time to choose ones career path than ever before. Due to existence of variety of options coupled with cut throat competition in the professional filed makes one confused as to what to pick up as career options. There are mainly three agencies which are largely responsible for a student’s choosing a career path. These are namely the student himself, parents, teachers and career counselors. Among all parents play the most vital role as they understand the real strength of their children and hence can guide suitably. The role of a student in choosing a career path is very important as it is him or her who has to continue their journey in their chosen path. Though there are no definite tools which can accurately determine what career one should choose yet a few simple steps can help one to make a decision in the right direction. First, one should jolt down the subjects of interests. The interest should be evaluated with skills necessary to pursue them in the longer term. A detailed strength-weakness analysis can complement to sort out the top rated career options. There should be enough aptitude to make a successful career. Secondly, one should explore or test the chosen option. One should act in the best possible practical way to find out what really excites him or her. Thirdly one should consider external factors such as personal responsibilities and their priorities, financial strength to pursue the option and flexibilities in changing the path if in times of uncertainties one can change the career option with minimum obstacles. Attending career guidance seminars, educational fairs etc can also help a student in knowing the latest development in the outside world apart from the bookish knowledge. Once a student zeros on a particular option they should focus towards their destination with strong fortitude and utmost dedication. They should have a persistent focus towards his or her goal and can seek the help of their teachers, parents and elders. Parents have a vital role in building a bright career for their children. Parents should facilitate in exploration of the right career option for their children. However, they should not insist their children to pursue a career of their choice. They can help their children by giving advices of successful people and their career growth and supportive instructions. But they should be unprejudiced to allow their offspring to follow their own dream. If parents try to compel their children to select a stream according to their choice on which their children may not have interest, the result may sometimes be disastrous. So students should always be given preference for their choice and at the same time it should be complemented by advices of the parents. Valuable advices and good wishes of parents help children to forward their step in new path of life. The best time to explore career options is the time when one completes his or her high school days. In India, the board examination is the most important time for a student. It is the juncture of taking a right decision on what to choose from the available options.